The young attractive disciples of the senior guru Jamuna Krishnan from New Delhi - Annaika Ahuja, Gayatri Seth, Anjana Natarajan, Tvishi Duggal, Radhika Tandon and Chandsi Kataria- gave an enchanting recital under the aegis of Maarga and Kalangan Centre for Classical Arts in Music Academy on 9th December 2016, before a packed audience. The recital commenced with a traditional Pushpanjali composed by Guru Jamuna Krishnan in ragam Naatai and adi talam. Immediately following were meaningful verses from Lakshmi Ashtakam, where goddess Lakshmi was delineated with her various attributes. She was portrayed as both the benevolent one and the destroyer of evil, both within and without - the latter idea brought out in the words "Sarva dushta bhayankari." She is also portrayed as the Universal Mother and the giver of knowledge - "Jagat stithe jagan maata." The central piece of the recital was verses from Leela Suka's Krishna Karanamrutham. The piece depicted Krishna from his infancy to boyhood. The artistes performed this item very gracefully and with absolute poise, bringing out the meaning of the lyrics by their convincing abhinaya, even at their young age. "Atyanta balam atasee kusuma prakasham" and "Vadane navaneeta gandhavaham" depicting Krishna as a child and the usual episode of Krishna stealing butter and eating it were beautifully portrayed by the young dancers, interspersed with well-choreographed jathis neatly executed with precision. 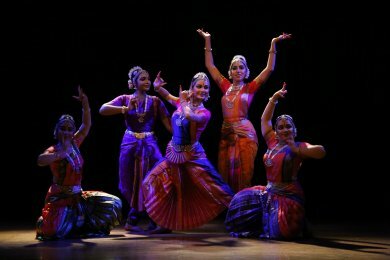 The piece ended with the Raas Leela which depicted one Krishna for each gopi dancing with him and was a delight to watch. Arunachala Kavi's "Yen palli kondirayya" in ragam Mohanam and adi talam was equally interesting. This soul stirring item on Lord Ranganatha of Srirangam where the poet asks Lord Rama whether he was tired after several valiant deeds commencing with Vishwamitra taking Rama to protect the 'yaaga' of the Rishis, followed by Sita Swayamvaram where Rama successfully takes the Shiva Dhanush, bends it and wins the hand of Sita, followed by Guha episode and others, culminating with the slaying of the 10-headed Ravana, was beautifully portrayed by the young dancers. The abhinaya for this item again was appreciated by one and all present in the audience. The last but one item was a Meera bhajan depicting Meera's intense love for Krishna, where Meera wishes that if she were born a fish, she would kiss Krishna's feet, if she was a cuckoo, she would sing to him in the forest and finally if she were a tiny pearl, she would lie on Krishna's chest as part of his beautiful necklace. This was again a delectable item to watch. The recital concluded with the Kadanakuthuhalam Thillana of the late maestro Dr. M. Balamurali Krishna and the attami and nrithya were a sheer beauty to witness. This item again was on Krishna - "Vadanamathe virisene adharamate murisene"- the face as beautiful as the lotus and the lips as sweet as nectar and "madhura gaanam bade na murali manoharudare" meaning the enchanting, magical music of Krishna which fills the heart with joy. This thillana is very appropriate in the present context where the late maestro left his mortal coil a few days earlier and this can be taken as homage to him. The bhava laden vocal support of K. Venkiteshwaran with the beautiful percussion of M.V. Chandershekar and the delightful violin by Easwar Ramakrishnan substantially enriched the recital from beginning to end. Ragini Chandershekar wielded the cymbals effectively which was also a great asset to the performance. 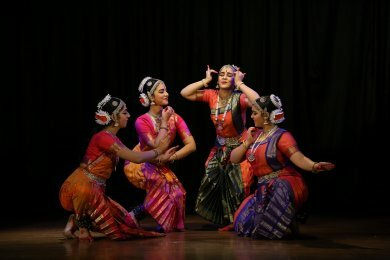 The young dancers had a good stage presence and carried themselves with absolute confidence and poise under the able tutelage of Guru Jamuna Krishnan, leaving the audience with an impression that they have a promising future with more opportunities coming in their way and with more maturity gained.